Since 1941 community citizens have answered the call to help others in need of emergency fire and medical services. Our members are diverse and come from many professions. Engineers, Police Officers, Nurses, Salespersons, Students and professionals from many trades, take time to respond to the call of duty as firefighters and Emergency Medical Technicians. As volunteers, we require the same rigorous training as career firefighters and Medical personnel do. Be assured that when you call 911, trained volunteers will be ready to respond. Use hashtag #33Heroes to spread the word about our fundraising campaign. 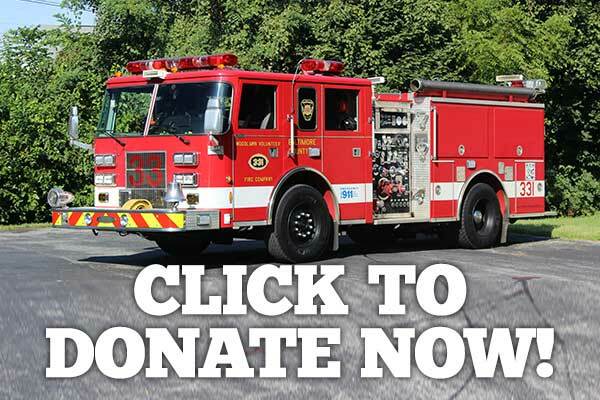 Remember to make your own tax-deductible contribution, and be one of our #33Heroes. Woodlawn Volunteer Fire Company is a 501c organization. Any donations you make will be tax-deductible.